This last month I have been very lucky to have been invited to taste vins clairs (in plural!) in lots of different places. 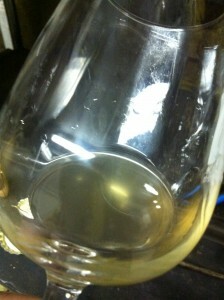 The term “vin clair” literally means clear wine – it dates from the time that the wine had cleared after the first fermentation;all the yeast and sediments having fallen to the bottom. I feel vins clairs are often a great expression of their particular terroir, as they grape varieties are generally vinified per cru or village. However, vins clairs tastings are not for the faint hearted – the wines are often very acidic, and can be a little thin. They are very different from other still wines made from the same grape varieties… One must remember these wines will be blended together, often with some reserve wine added to make the final base wine which will be bottled and undergo the second fermentation. 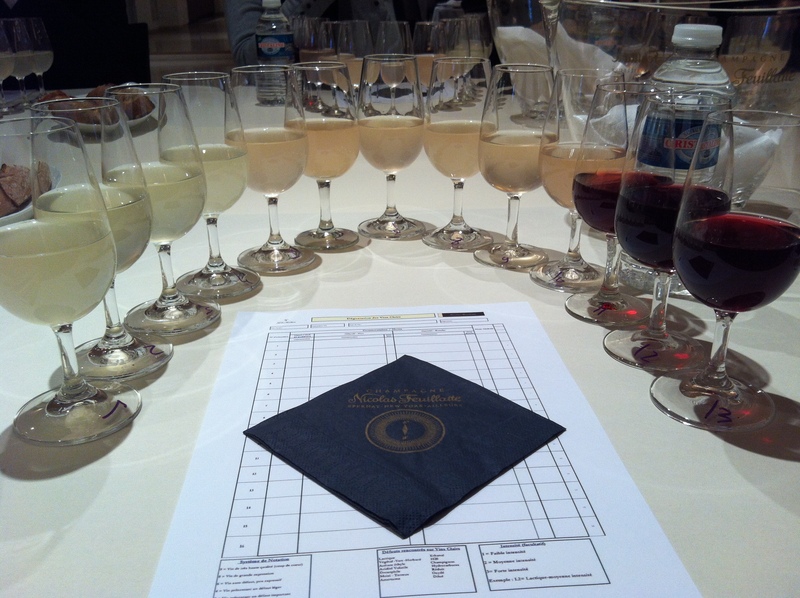 It takes practise to understand these tastings – in the same way that tasting en primeur wines takes practise. You are looking for characteristics – acid, mouth feel, elegance, minerality and flavour – and imagine them after a second fermentation in the bottle, several years of aging in the cellar, and with a dosage added. In other words – you taste the wines and think of the final blend, and even the Champagne and try to imagine what each wine can add. In a way it is desecting the Champagne and piece it back together – and by doing so one slowly learns about the sub terroirs in Champagne as well as the differences in savoir faire and the individual style of the champagne makers. These last few weeks I have tasted quite a few vins clairs and I would like to share 4 of them. The tastings have been very different yet in their own way they have left a mark on me; I learned a lot at each place but most of all I feel these 4 tastings are a great example of the diversity we have in Champagne. The most formal of vins clairs tastings I attended was at Nicolas Feuillatte at the beginning of the month. I had received an official invitation, confirmed my attendance by post and I took place at tasting with about another 20 people. 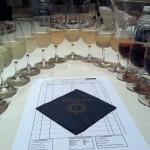 Most other tasters were from Champagne, and a lot of them worked for the CIVC or the SGV. There were a few members of the Press – all French and all involved with specialized viticultural magazines. David Henault, the Chef de Cave invited us to quickly introduce ourselves before we started the tasting with 4 Chardonnays. I was really happy I took detailed notes as I quickly realized that we were all supposed to say a little about the wines and pick our favourites. We continued this way with the 3 Pinot Meuniers, 3 Pinot Noirs and 3 red wines (Pinot Noir as well). At lunch I was seated next to David and told him I had been extremely impressed by the quality of the wines; it is a fact that 2012 is a great year – but I had expected to taste thinner, more acidic and less flavoursome wines. David admitted that he received his fair share of these wines but that they had already been blended for the pending bottling of the brut. The wines we tasted would go in special cuvees or become reserve wines. I was impressed by his straight forwardness as after all I was one of what he called difficult foreign writers :-) We got to taste a few of the special cuvees, which are made in relatively small quantities and I was particularly impressed by the Grand Cru Vintage Blanc de Noir (100% Pinot Noir 2004). I had decided to attend the Feuillate Vins Clairs tasting because I wanted to get a better understanding of the vintage across the board. 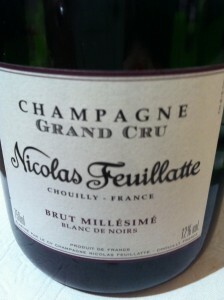 I believed that Feuillatte being the largest co-operative would have a wide variety of wines. Whilst I did not really achieve what I originally set out to do I learned a lot from my chat with David about the “big blending exercise” and discovered the co-operative has access to terroir wines as well which they sometimes choose to vinify separately. The second tasting which really stuck was my tasting of a selection of “Clos de Goisses” wines at Philipponnat. I had been invited by Charles Philipponnat, after a few chats on Facebook, and was lucky to be one of the first external guests to taste through several different wines from this famous vineyard. We tasted together with Antoine de Boysson, the Philipponnat Export Manager, and for each wine Charles explained where in the Clos des Goisses it came from. We started with a few wines vinified in stainless steel tanks, however the bulk of the wines underwent fermentation in the traditional Champagne barrels (205L) and a few “double barrel” -demi-muid (410L in Champagne). The Clos des Goisses is planted with both Pinot Noir and Chardonnay but I there is a majority of Pinot Noir. 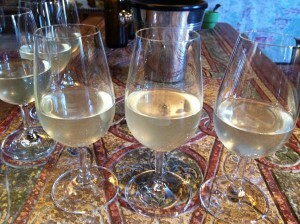 This harvest included 3 press loads of Chardonnay and 8 of Pinot Noir and I tried some wines of each pressing. It was amazing to taste the differences in flavour per subsection of this single vineyard, and whilst the Chardonnays where good, the Pinot Noir was outstanding! All the wines had an almost round mouth feel, great intensity of flavour and a balanced acidity and freshness. Towards the end of the tasting we tried few Grand Cru vins clairs which were good as well but they lacked the rich and intense character of the Clos des Goisses. 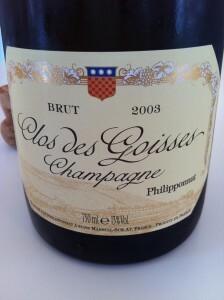 The amazing 2003 Champagne Philipponnat Clos des Goisses! 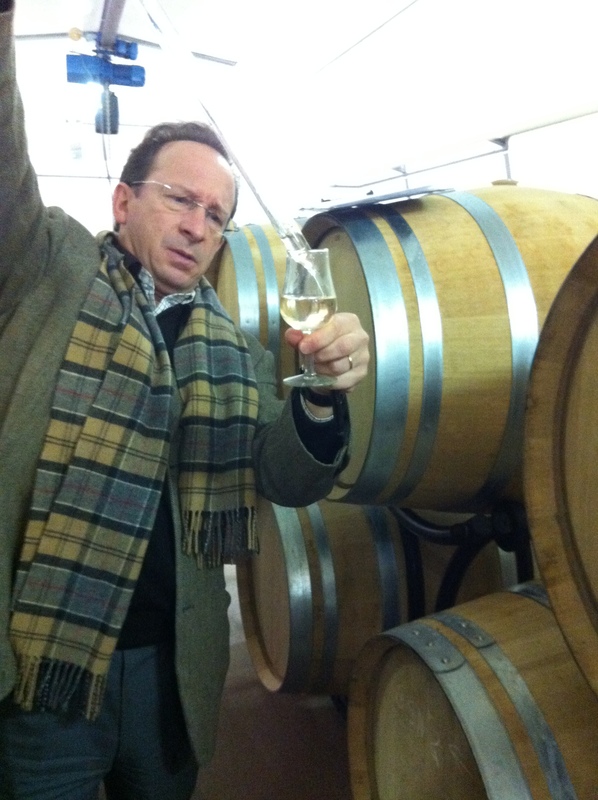 My third great tasting experience came a week later, when I went to Chouilly to visit Champagne Legras et Haas. Before I arrived there I knew very little about them except that the very generous Jérôme Legras had been one of our sponsors for our #onthewineroad trip to California last year. I had come through Chouilly a few times this month and had been thinking of contacting Jérôme to make an appointment when he reached out to me. Chouilly is one of the 17 Grand Cru villages but somehow it is a little less famous than the other Grand Crus in the Côte des Blancs. It is also the only Grand Cru village with a mainly northern exposure and it is the largest Grand Cru. 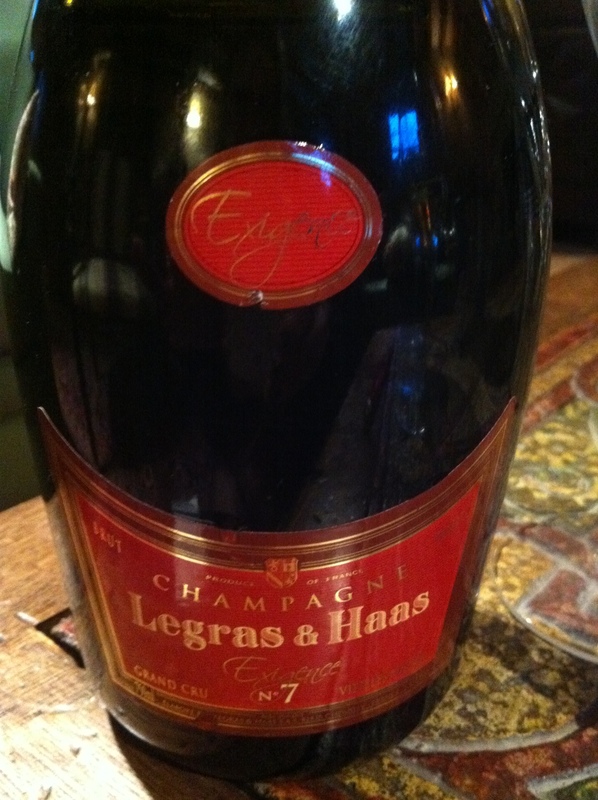 The Legras family has had vineyards in the area for a few generations and in 1991 François Legras and his wife Brigitte Haas founded, together with their 2 oldest sons Rémi and Olivier, the Champagne House Legras et Haas. Jérôme joined the family business in 2006 and today the family as a whole runs the Champagne House. The decision to be a “Champagne House” or negotiant, was a conscious one, as the family wanted to have the freedom to make the Champagnes they wanted to rather than be restricted to making wines from only the family vineyards in Chouilly, Vitry le Francois and Les Riceys. Hence, they purchase each year some Pinot Meunier for their Brut Tradition as well as some Ay Grand Cru Pinot Noir (only in exceptional years) for the Cuvee Exigence. After a quick tour of Chouilly where Jérôme explained the different terroirs in the village, we tasted through a few specific Chouilly terroirs as vins clairs. Again I was totally amazed by the different characteristics of the 3 sites I tasted – the first wine was very tropical and rich , the second showed more citrus and apple, whilst the 3rd wine was more elegant, lacy and mineral. The most interesting part of this exercise was that I had the wines right next to each other so I could go back and forth. I also tasted two different Soleras of Chardonnay which the family uses for the Cuvee Exigence Grand Cru. The oldest Solera was rich, complex and very layered, whilst the second one – which is significantly younger, was a lot fresher and more linear. We finished off the tasting with a few Champagnes which we tasted out of order, starting with the Premium wines and finishing with the fresher Brut Tradition. Again I fell for the richest and most opulent wine – the Cuvee Exigence Grand Cru 7 – as it is the 7th time the family decided to make this wine. The base wine is a mixture of 50% reserve wine from the Solera (from Chouilly) and 50% 2007 Pinot Noir from Aÿ and has been aged for around 5 years. I loved the power and intensity of the wine, however this Champagne is definitely a meal wine. Whilst I was tasting and talking to Jérôme, I became totally intrigued and in a way very excited by the the experimental nature this smallish Champagne House has. They actively look for innovation and take risks by trying out small runs of new cuvees. They test these wines over time and very often they sell the lot off as exclusive one off’s. However I strongly feel that by working in this way Champagne Legras et Haas expand their horizons in ways which are very rare for this region. I really hope to go back soon to taste more of the range including some of these special and rare cuvees!! 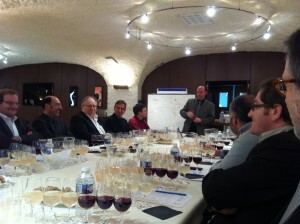 My last WOW tasting was at Champagne Charlot-Tanneux in Mardeuil last week Monday. Vincent Charlot had invited me, again through Facebook, and again I knew very little about this producers. As we had set a date Vincent had mentioned that he was off to a biodynamic conference in Bordeaux later in the week and I have to admit that I was pretty excited about discovering another biodynamic producer!! It was a beautiful sunny day last Monday which was a good thing as the next few hours were spent in the vineyard. Vincent took me from plot to plot in his 4 hectares of vineyard and opened up his soils so I could see all the activity going on in it. In between his rows he has natural grass and we even saw a few wild flowers which had started to flower encouraged by the few days of good weather. I was overwhelmed by all this life in WINTER and definitely want to have a similar tour in spring to see Vincent’s vineyard really buzzing! 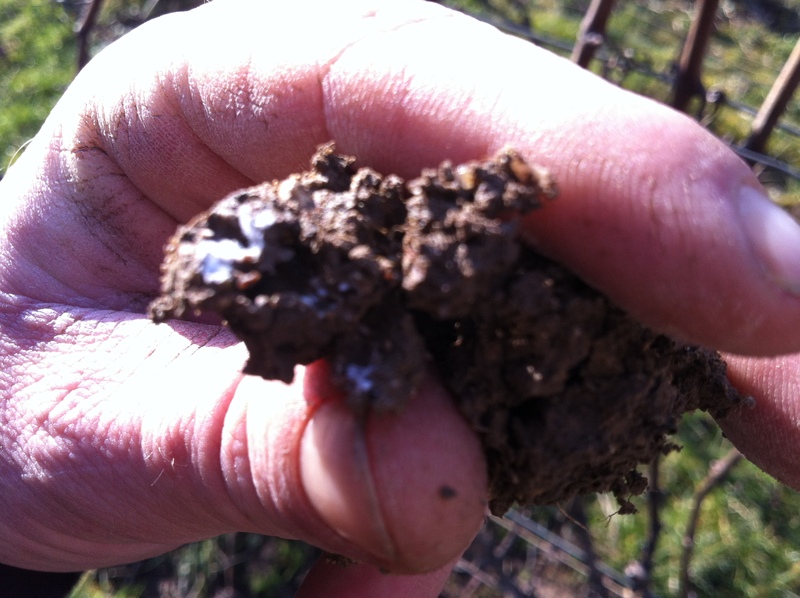 Vincent also showed his compost heaps to me – he explained his preparations and spoke about the different herbal sprays he uses in the vineyard. This guy really knows his land, understands the circles of live and wants to work with nature to get the purest expression of his terroir! After the vineyard it was time to taste the vins clairs. All vinification is done in old Bordeaux Barrels (225L) and happens spontaneously (using natural yeast); ferments are quite slow and the wines do not go through malolactic fermentation. Whilst some wines were still in the last stages of fermentation they were very pure and almost electrifying. Again they tasted significantly different from plot to plot, and the acidity was extremely balanced and integrated. Once fermentation is completely finished, the wines will remain on their lees till August when they are racked, blended and bottled. From this wee story one can see that the palate of wines in Champagne is pretty big – and I believe this comes from the terroir including the savoir faire and expression of the terroir by the winemaker. It is this what makes up the richness and uniqueness of this region and draws me in a little more with every wine I taste. This entry was posted in biodynamic, Caroline's Champagne, Champagne, terroir, vins clairs and tagged biodynamic, Caroline's Champagne, Champagne, Champagne Charlot-Tanneux, Champagne Legras et Haas, Champagne Nicolas Feuillatte, Champagne Philipponnat, Charles Philipponnat, Chouilly, Clos des Goisses, Cuvee Exigence, David Henault, Jérôme Legras, natural yeast, savoir faire, Soleras, Terroir, vin clair, Vincent Charlot, vins clairs, vins clairs tasting, wild flowers. Bookmark the permalink. Thank you for the head up! I have to admit that the wines I chose to write about are closer to the examples of 2 growers you give – and indeed they were easier to approach.